This product is a download, and will not be shipped to you. After you check out, you will receive an email thanking you for your order from orders@harpcenter.com with the link(s) that will take you to your download(s). This e-mail will be sent to the "Ship To" email address that you specify during checkout, so be sure to input the correct "Ship To" e-mail address. Please add orders@harpcenter.com to your approved e-mail list. If you do not receive an e-mail within a few minutes after you place your order, please check your spam folder. Please scroll to the bottom of the email to see the links to download. You can access your downloads by clicking here and entering your order number, email address, and billing zip code. If you created an account with us, you can also find your downloads by going to "My Account" and clicking on the "Downloads" link. Once you receive the e-mail, please click the link(s) and print your PDF(s) as soon as possible. The link(s) will expire after 30 days. If you are unable to print your PDFs during that time, please contact us and we will assist you. You are authorized to print 2 copies for your own personal use. There will be no shipping charge if all of the items you are ordering are downloads. Just choose the "No Shipping Charge" option on the shipping dropdown list during checkout. If you order regular (non-downloaded) products at the same time, the shipping charges will be for those additional items. Your respect of the copyright laws will help support the musicians and arrangers who created this work, and will encourage more harp music to be produced in the future. Please do not make multiple copies to pass on to others. You can help keep downloadable harp music viable and available by encouraging your students, friends and relatives to purchase their own copies. Thank you for your assistance in this endeavor. If you have a problem with your download, please contact us at downloads@harpcenter.com for assistance. Please note that downloads are not "returnable." 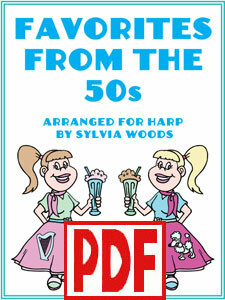 This product is a PDF download of the printed music book Favorites from the 50s arranged by Sylvia Woods. This PDF includes 40 favorite songs from the 1950s. These vintage songs were made popular by artists such as Paul Anka, Frankie Avalon, Harry Belafonte, Perry Como, Sam Cooke, Bobby Darin, Gene Kelly, Johnny Mathis, Patti Page, Elvis Presley, Frank Sinatra, the Champs, the Everly Brothers, The Fleetwoods, Buddy Holly and the Crickets, the Four Preps, and MORE! Plus, there are songs from The Sound of Music, The King and I, West Side Story, The Music Man, and The Howdy Doody Show. Seven of the pieces have 2 separate arrangements: one for lever harp players who tune their harps to C, and another for lever harp players who tune their harps to flats. Pedal harpists can play either version. This PDF is 123 pages including 112 pages of music.